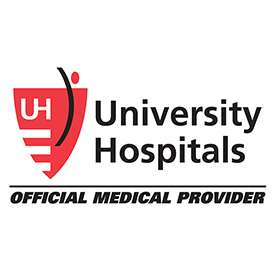 COLORADO SPRINGS, Colo. — USA Triathlon and the Greater Cleveland Sports Commission today announced that University Hospitals will serve as the Official Medical Services Provider of the 2018 and 2019 USA Triathlon Age Group National Championships, both of which will be held in Cleveland. Founded in 1866, University Hospitals serves the needs of patients through an integrated network of 18 hospitals, more than 40 outpatient health centers and 200 physician offices in 15 counties throughout northern Ohio. The system’s flagship academic medical center, University Hospitals Cleveland Medical Center, located on a 35-acre campus in Cleveland’s University Circle, is affiliated with Case Western Reserve University School of Medicine. The main campus also includes University Hospitals Rainbow Babies & Children’s Hospital, ranked among the top children’s hospitals in the nation; University Hospitals MacDonald Women’s Hospital, Ohio’s only hospital for women; and University Hospitals Seidman Cancer Center, part of the NCI-designated Case Comprehensive Cancer Center. UH is home to some of the most prestigious clinical and research programs in the nation, including cancer, pediatrics, women’s health, orthopedics, radiology, neuroscience, cardiology and cardiovascular surgery, digestive health, transplantation and urology. UH Cleveland Medical Center is perennially among the highest performers in national ranking surveys, including “America’s Best Hospitals” from U.S. News & World Report. UH is also home to Harrington Discovery Institute at University Hospitals – part of The Harrington Project for Discovery & Development. UH is one of the largest employers in Northeast Ohio with 27,000 employees. For more information, go to UHhospitals.org.